IA Design were engaged by Knight Frank to transform their traditional office layout into an open plan environment. A key driver of this office modification was to ‘upgrade’ the space from its ‘dated’ state into a contemporary environment that would show Knight Frank as a market leader in the industry. 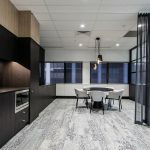 The scope included the removal of existing partitions and furniture, replacement of workstations with a sit-to-stand model, introduction of various support spaces and development of flexible working and collaboration zones. The upgraded front-of-house provides an inviting environment for visitors, guests and clients representing the Knight Frank brand in a positive and contemporary way. This extends to the back-of-house area with upgraded workstations from traditional style to ABW sit-to-stand workstations, and the addition of greenery and walnut joinery to modernize the space and create an enjoyable environment for employees. 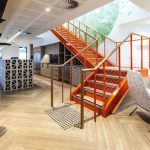 Custom wall graphics add a unique and quality feel to the core walls, whilst custom timber screens add a privacy element. The final design transformed the existing environment into a completely new look and feel, achieved with a minimal budget. IA Design supported Knight Frank’s Project Manager Team whilst working alongside CDI to ensure this project was delivered successfully.